Hello! It’s Katie with Abella’s Braids and it’s great to be back! I had a lot of fun coming up with some braided ponytail styles to show you and I hope you like them! Most of them are pretty simple but of course, I had to add some more advanced ones for those of you that like more of a challenge! A couple of the styles use tiny rubber elastics but the rest only require a larger elastic to pull the hair back into a ponytail first! I always like to wrap my elastic with some hair and pin it underneath to make the ponytail look a bit more polished but that’s totally optional! This first style is super simple! Just divide the ponytail into three equal sections. 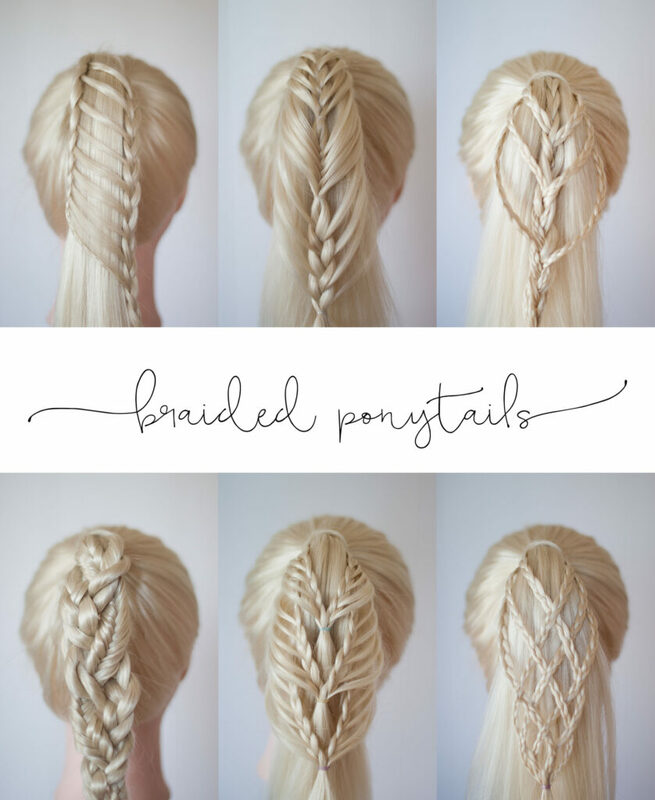 Braid each section into a different type of braid! For this style, I did one fishtail, one three strand and one two strand (twist)! 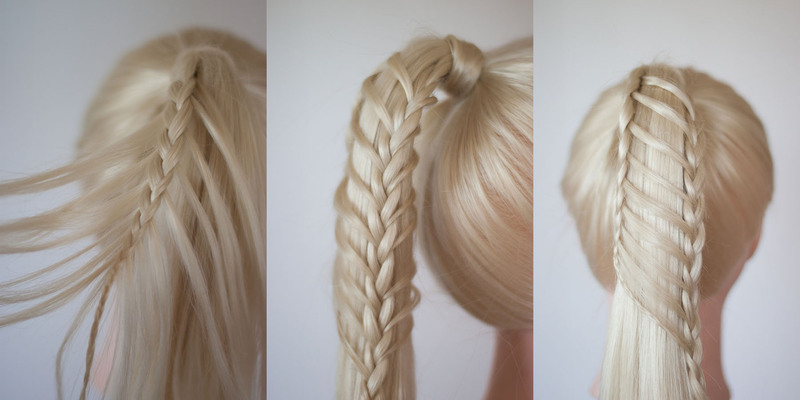 Then simply braid all three together! I love how chunky this look is, and how much texture is involved! For our second style, I took nice sized chunk of hair from the left side of the ponytail, and did a three strand braid all the way down. While I braided, I left a small piece of hair out before I crossed each section over. It ends up looking like the photo on the left. Then I went to the right side and picked up another chunk of hair about half the size as the one I took on the left, then I started a three strand braid. Each time I crossed over on the left, I added a piece that I left out on the left section into the braid. When I crossed over on the right side, I reached under and grabbed a section that I had left out on the left side of the first braid. This sandwiches the ponytail between the two braids. So sleek and elegant! 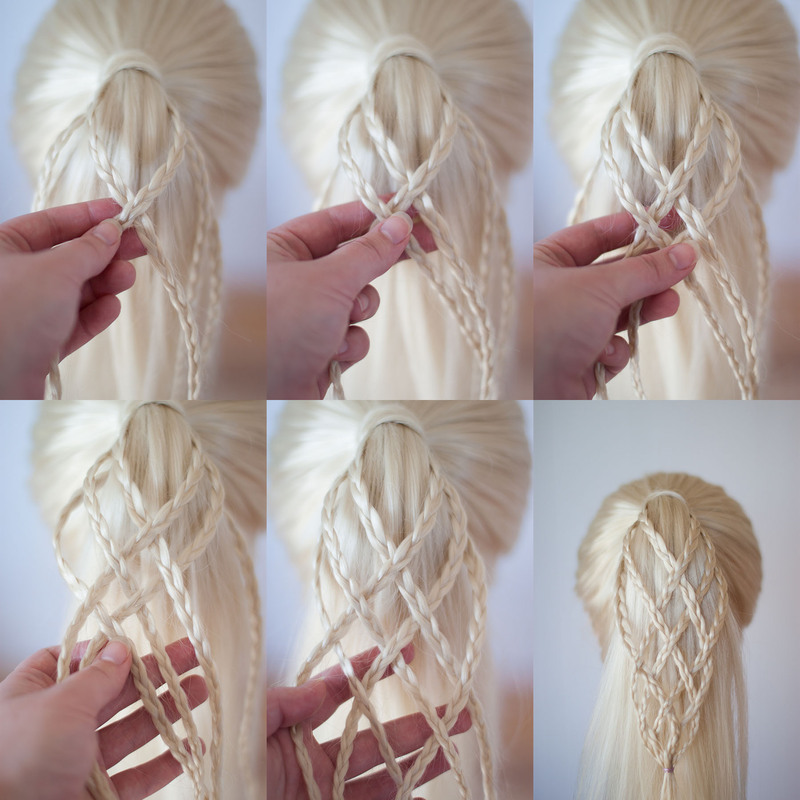 This is one I would definitely recommend wrapping the elastic of the ponytail with hair on. This style is two types of mermaid braids, separated in three sections with those small, clear elastics I was talking about. Start with a good chunk of hair from the top, middle. You’re going to do a French braid but when you’re adding in pieces, only add in really small pieces from the outside edges of the ponytail. Put a small elastic once you’ve braided a couple of inches. 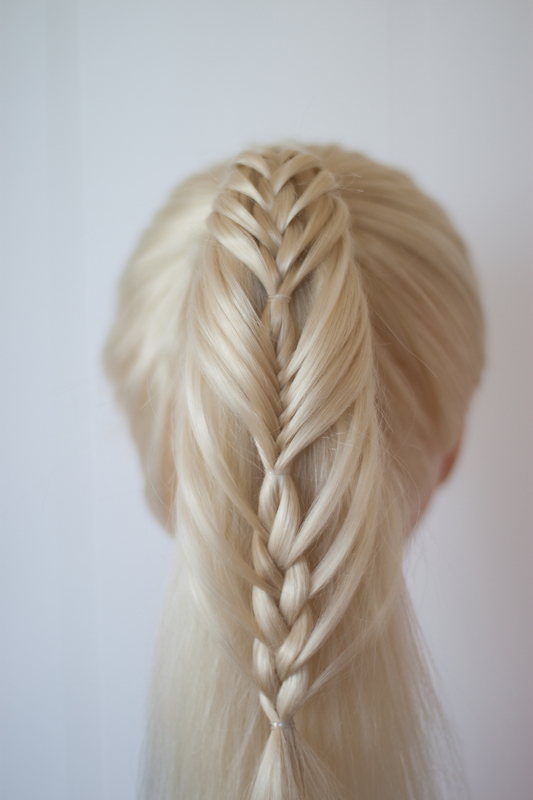 Take the ends of that one and start a French fishtail braid, adding in small pieces like you did in the step before each time you cross over. After a couple inches, put another elastic and finally, start another three strand French braid. You can keep going with the pattern if the ponytail is longer if desired! 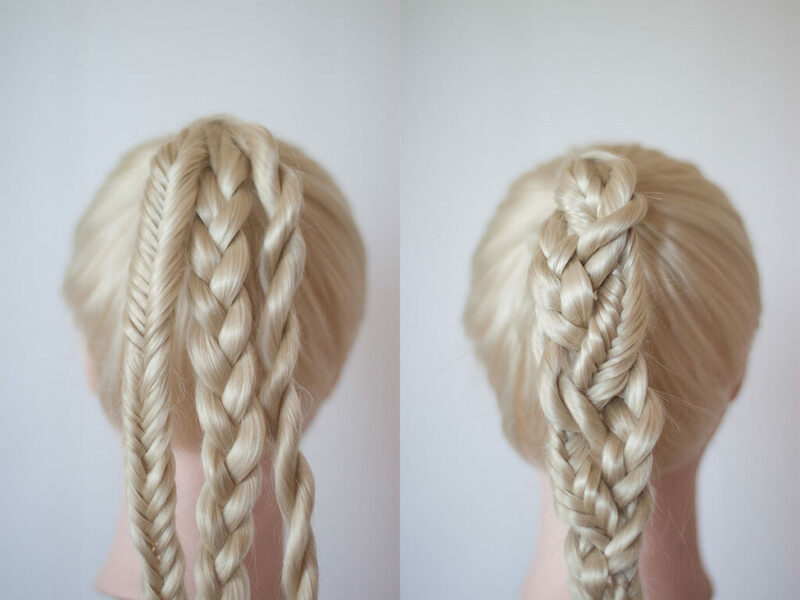 Make sure to braid pretty loosely to achieve the pictured effect. I love this forth style because it looks so intricate but it’s actually very simple! You will need small clear elastics. You can use colored bands, too for a fun pop of color! Our fifth style is very simple! 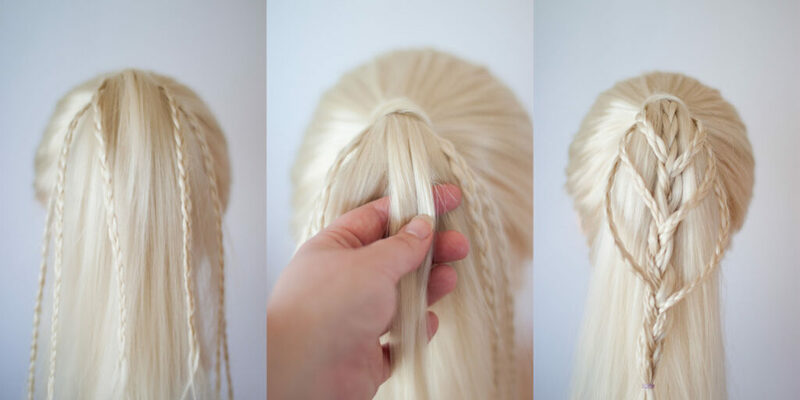 Take small sections of hair on each side of the ponytail and make three strand micro braids. I made three on each side. Then you start a three strand braid in the middle, and add in a braid each time you cross a section over! If your ponytail is longer, add more micro braids! This last style was done using the same micro braids from the previous style. You’re going to bring the micro braids to the center and weave them. I started by crossing the first micro braid on the left under the one on the right. Then I took another braid from the left and crossed it over the braid furthest to the left. Go back to the right and cross the next micro braid under the first braid and under the next. 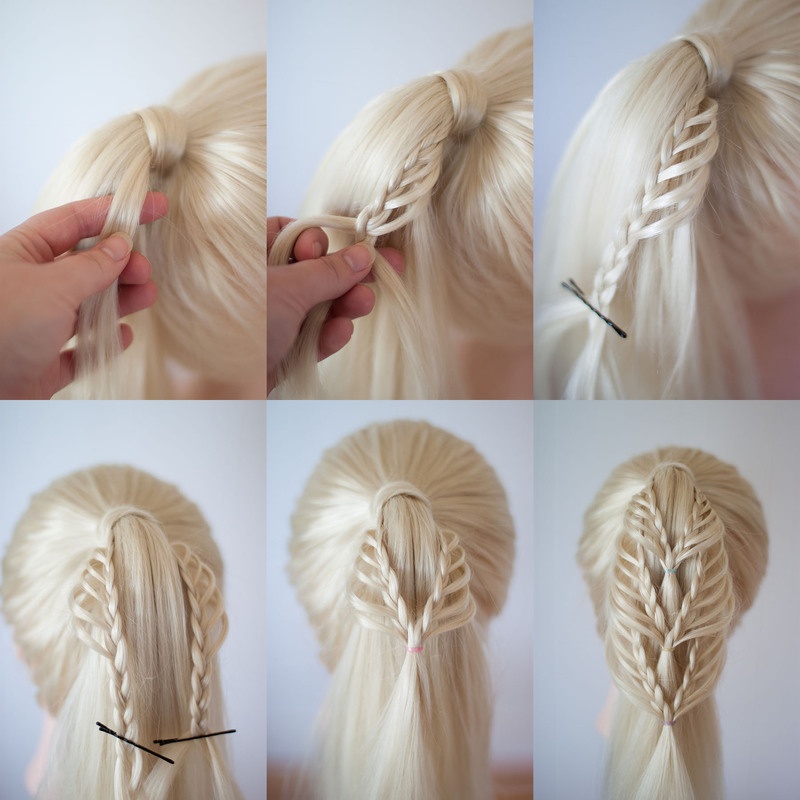 Take the last micro braid on the left and cross it under the furthest left braid and over the next. Go back to the right, take the last micro braid and cross it over, under, over. Now that you’re out of micro braids to add in, continue going back and forth between the left and the right sides, crossing under the braid you previously crossed over and vice versa until you’ve reached the desired length. Don’t be afraid to tug gently at it a little when you’re finished to perfect the look and finish off with hairspray to hold your look! Weaving can be intimidating at first, but you’ll get the hang of it with lots of practice! Thank you for reading and don’t forget to check out Abella’s Braids!